“Not just to play music but to play with music" - was the theme at the Nokia Remix event held in Singapore on October 3 and earlier in London. Nokia announced the debut of its pioneering "Comes with Music" digital entertainment service and unveiled the new Nokia 5800 XpressMusic that brings touch UI to a broader segment of consumers. Delivering on Nokia's vision to provide the best total music experience possible, the Nokia 5800 XpressMusic will be among the first devices to support "Comes With Music", Nokia's groundbreaking service which offers one year of unlimited access to the entire Nokia Music Store catalogue. Customers who buy a "Comes with Music" device will be able to explore and enjoy a diverse catalogue of music of international and local artists in the most natural and spontaneous way, revolutionising their digital music experience. However, accessing the Nokia Music Store from our Bangladesh market involves a few hurdles that need to be sorted out first. Piracy, the number one problem, is followed by our own consumer behaviour, as well as the credit cards acceptance issue. Once we take care of these rogues, the pleasures of the Music Store is ours for the taking. When it comes to music phones, people all over the world want a device that is a great music experience - loud and powerful speakers, easy synchronisation on top of phone functionality, with direct access to important contacts and content. Whether we like or not, and more importantly, understand it or not, the digital music sales are steadily increasing. And with it, the desire to own a device that sort of takes care of your Internet surfing needs, your music requirements, your camera, while keeping you connected. Nokia taps into its keen understanding of their consumers' and offers its new device Nokia 5800 XpressMusic. This device is truly a mini boom box with a vibrant touch screen for the mass. "Comes With Music sets a precedent for consumer value and convenience that the rest of the digital entertainment industry is already copying," said Andrew Connell, Head of Entertainment & Communities Gategory Management, Nokia. "The freedom and simplicity of the service is unparalleled. "Comes with Music" gives you unlimited access to the millions of tracks in the Nokia Music Store and the music is all yours to keep - because its not a revolution unless you get to keep your music." "As Nokia's first mass market device with a touch screen, the Nokia 5800 XpressMusic turns a user interface into a 'human interface' by truly putting people first. For example, we've introduced the Nokia Contracts Bar, which is like a digital RSS feed on your life," said Tuula Rytila-Uotila, Vice President, Category Management, LIVE Category, Nokia. Taking advantage of touch screen technology, the Nokia 5800 Xpress Music introduces the 'Media Bar', a handy drop down menu that provides direct access to music and entertainment, including favourite tracks, videos and photos. The Media Bar also offers a direct link to the Web and to online sharing. Because the Nokia 5800 Xpress Music supports Flash content, individuals can surf the entire web, not just pieces of it. In addition, the Nokia 5800 XpressMusic offers all the music essentials, including a graphic equalizer, 8GB memory for up to 6000 tracks and support for all main digital music formats, and a 3.5 mm jack. Built-in surround sound stereo speakers offer the industry's most powerful sound. The Nokia 5800 Xpress Music also features a 3.2 megapixel camera with Carl Zeiss lens and, with a single touch, images or videos can be shared via a favourite online community, such as Share on Ovi, Flickr, or Facebook. Music Playlist song titles can also be shared through Bluetooth, MMS or online sharing. 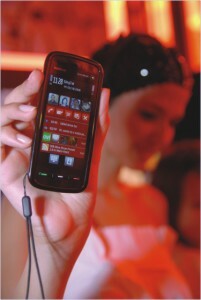 The Nokia 5800 Xpress Music supports 60 languages worldwide, which covers nearly 90 per cent of the world's population. As people around the world use their phones in different ways, the Nokia 5800 XpressMusic offers a variety of input methods including a virtual alphanumeric keypad, a virtual computer-style keyboard, a pen stylus-and for true music enthusiasts, a plectrum -- are all available. The Nokia 5800 Xpress Music will be available worldwide beginning in the fourth quarter of 2008 for an estimated retail price of 279 EUR before taxes and subsidies. 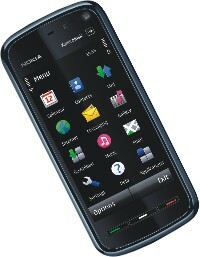 The Nokia 5800 XpressMusic featuring "Comes with Music" will be available early next year. While we say that music is universal we cannot deny the fact that what you listen to says a lot about your personality and if we are allowed to twist this basic fact a little we can surely say what device you are carrying and enjoying your music with also puts the spotlight on your choice. For now just touch, play and share your Nokia goodies. Singapore's grand launch event was made extra special with powered up performances by rock band Lifehouse, which made sure that everyone left with some unforgettable memories. The word philately was coined from greek (philos + ateleia) but its appeal is widespread, its attraction, timeless. 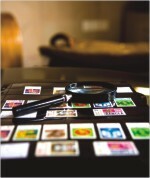 As a pastime stamp collecting has somewhat been shelved like old stock books, gathering dust and mites. The time is right for a revival. Bring out your tongs and paper knives as we take a look back into the hobby, and the fascination of mails. I was on my way to Banani in a rickshaw from Gulshan-2. The sky was bright and the soft breeze blew through my hair. The superb weather made me see things in a new perspective. Suddenly there was a screeching sound, which made me turn. I spotted a street cleaner, her sari all torn and the aanchal tugged into a tight knot on her waist. She looked grimy, preoccupied with cleaning the street. She was not all that pretty and I did not take a second look. But on the other corner of the street, I caught sight of a man, who had his eyes set on her. He was blissfully watching her sweep out the leaves and the dust. He noticed something beautiful in her, which I failed to do. To him, she must have looked like an angel, but to me she was so very ordinary. Definitely, beauty is in the eyes of the beholder. We are all special to some one or the other. No matter if the world tells you otherwise, you will still be precious. Many of us get upset if we can't get the same dress or hair-cut that we have seen on our favourite TV serials. We starve ourselves with empty desires. Young women read in magazines about Chantelle Houghton, and her surgical enhancements. They have a great influence on teenagers, and sometimes to such an extent, that they are even at times ready to undergo the same drastic changes. So many of us are increasingly going out of our way to dress like the fashion icons. Never mind how inaffordable the expensive designer wears are! Never mind if it suits us or not! We don't have to dress up like a star to look gorgeous. What is right for one person may not be right for another. For the ones who like us will continue to do the same regardless of how we look. Beauty does not lie in copying others or in expensive designer dresses, but in carrying ourselves well. Simply a nice chic dress that suits us and in which we feel comfortable is perfect. Something expensive is not necessarily superior to cheaper items. Expensive possessions might enrich our living but cannot bring joy into lives. Big things do not mean contentment. Happiness won't come if we can't perceive and recognize it's actual worth. There is no point in getting upset over little things and ruining the better stuff that is in store for us. One doesn't need to wear designer clothes or be a celebrity look-alike to have a memorable time with friends and family. Our characters play a more important role. Nothing more is needed with good friends and other loved ones around us.